I did say on an earlier post that I would give you an update on my Month of Letters progress and so here it is. The short version is that I am still keeping going and I think I can safely say I am on track to complete the month. If you want a bit more detail than that, do read on And if you want to look at one of my previous Month of Letters post try here or here. You might want to give it a try yourself next year! As I have done before I jotted down a list of possible recipients before starting, beginning with family and friends back in the UK. I have begun to see Month of Letters as a wakeup call where I have become slack in keeping in touch with old friends. I then add all of my Ireland based friends, most of whom are in Dublin. I suppose really I end up re-writing my Christmas card list in February (maybe next Christmas I should simply file it away for February instead of putting it in the recycling bin). My intention to do something really imaginative in the mail line this year has not actually transpired. In fact, I am being a very thrifty correspondent and operating a ‘using up’ system, which I am aware may sound rather heartless. However, it is all in an environmentally aware kind of a way really. I have collected up so many postcards over the years that to either dump them or buy yet more would be foolish. And anyway, I do have some nice cards to bestow. This year I have been using up my Penguin book jackets, Spike Milligan cartoons and some Chagall cards from The Tate Gallery. I have also indulged my passion for free stuff, acquiring book marks, postcards and tourist information cards to enclose with a note for my international recipients. The one big difference for me in doing Month of Letters this year is that I no longer have my dad’s birthday to mark, as he died in June 2016. I also used to squeeze in my parent’s anniversary card at the end of the month since it fell at the beginning of March, so that has now gone. I gave the challenge a break last year for these reasons, but decided to return afresh this year and try to include as many people as possible who mattered to me. It’s never too late to make an effort somewhat greater than clicking on a Facebook ‘like’ button for a change. I will say no more for fear of sounding mawkish but you see what I mean. days to go so I might have to double up a bit more to fit in the waifs and strays. I have been writing to my mum more often these days and also sending mail to our daughter who is studying away so I already have been doubling most days. This year I have included some new faces, as I have despatched postcards to new correspondents gained from the Month of Letters membership. This has broadened my range to Canada, Scotland and Northumberland (and I haven’t quite finished). I have added in here pictures of some cards that I have received in return, but the nice thing is that I usually find that replies trickle through into March, which makes February into a nice long month really. And now I am off to pen my last few postcards of the month! I have written about tackling the February ‘Month of Letters’ challenge before on The Landing and on Writing.ie, so I thought that I would give you a progress report on my 2015 attempt. As usual, I began writing enthusiastically, but this time around, I entered a sort of sluggish phase part way into the month. The original rules of the challenge state that you don’t have to post on Sundays (nor, as the challenge was set by an American writer, on February 16 for President’s Day). On my first couple of attempts, I was enthusiastic enough to include Sundays (despite there being no mail collection on Sunday in Ireland) but this year I have observed the breaks and I feel slightly lazy for having done so. As I ignore the US Public Holiday, that means posting twenty-four items during February. Missing the Sunday letter meant that I despatched my first mailing on 2 February – so far so good. I began the month with a list of possible suspects (in no particular order) and worked from that as the days went on. Originally I had conceived the idea of putting names of possible recipients into a hat and drawing one each day. I thought this would be great way to add a nice element of serendipity to the proceedings. Sadly, it was not to be due to my unfortunate inefficiency. Therefore, I am still working from the list but trying to maintain an air of randomness by not following the list in order. The down side to this is that I have noticed a distressing tendency to do the ‘soft options’ first. In other words, the people I see the most often and to whom I therefore wouldn’t send a long letter, but perhaps only a postcard or note. Of course I worry that someone will think, ‘Hang on a minute, how come I am not getting a letter until the 23rd? Does this mean that I’m not as important as 22 other people?’ or words to that effect. Maybe I just worry too much. After all, as I write this blog post I am aware that I have yet to post a letter to one of my sisters but I don’t think she’s likely to take offence at that (I hope). Some folks do actually end up getting more than one billet doux as the challenge rules stipulate that you must reply to every letter received. If you really get into the spirit and rhythm of the challenge then there is no reason to post only one item a day. I could post two, three or even more. As February moves on to meet the March lamb (or lion) I am feeling pleased that I have kept my pen diligently moving. I might even have a last minute flurry of scribbling to squeeze in a few extra people. As usual, I have factored in my dad’s birthday and my parent’s anniversary. I was probing my conscience as to whether I can claim dad’s birthday present as an item posted when I have already counted his card in. It seems rather sharp practice to me, so I might have to reprimand myself. As in previous years, I have been delighted when my recipients have responded in kind. I have scanned in a couple of replies, including Teri Farrell’s postcard with her original artwork. One to frame I think. I am already thinking about how to make next year’s challenge a little bit different from previous years. The author of the challenge Mary Robinette Kowal suggests that you don’t have to actually send a letter, but something else such as a swatch of fabric as a keepsake. I like that idea, so perhaps I will collect miscellaneous items during the year and then decide whom to send them to next February. And as next year will be a leap year then it would be a great way to do something a little different. Meanwhile, it’s back to the letter writing for 2015. 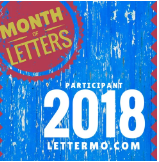 Has anyone else been participating in Month of Letters? Today’s bag focussed on the three to be found at Malahide Castle (but I am not saying exactly where, or which ones they are so as not to spoil anyone’s fun) which made for a pleasant Sunday morning excursion. Before heading to Pearse Station to get the DART, we decided to tick off the last of the Southside city centre Easter eggs. We were only missing the egg on display in the Merrion Hotel. (Now, this is going to be a bit of a spoiler so look away now if you prefer). As we approached the hotel, I was rather hoping to spot the egg on a plinth outside the building. It was not alas, to be. I had visions of us trawling around the interior of this smart hotel on a rather ‘egg-centric’ search while brandishing our booklet and pen to the alarm of respectable hotel residents enjoying a late breakfast. I confess here and now that I did ask the trio of door attendants standing chatting outside, about the exact location of the egg. They said that it was inside the premises (they did specify the location but my lips are sealed) and pointed in the general direction. At the hotel desk, I asked staff for more specific details, and one receptionist very kindly showed us to the egg. I will just say that we might not have located it otherwise, without wandering for quite a while through lounges and corridors. By the time the hunt is over, the amiable staff of the Merrion Hotel might be a little tired of random people wandering in off the street waving maps at them. Perhaps some of the hunters may stay on to have tea afterwards and make it worthwhile for the hotel staff. Could this have been the cunning plan all along? I will let you know if and when we reach our goal of making a century of eggs. Meanwhile, I am almost at the end of my February letter and postcard writing stint which I have greatly enjoyed. In my next post I will give a progress report on both of those challenges. The trouble is, I just can’t stop thinking about chocolate Easter eggs. On with The Big Easter Egg Hunt!